After battling with queues of people lining up at Din Tai Fung and bumping into oversized trays filled with noodle boxes and soft drinks, I finally found the stairs leading up to the brand new Level 6 dining level of Westfield. Step-by-step the noise of the downstairs crowd was drowned out and the frustration from all the pushing and shoving was promptly forgotten. Long communal tables, bar stools or tables-for-two offer diners at Spiedo a little bit of anything you like. A quick espresso at the bar? No problem. A power lunch to discuss business in a quiet back table? Sure thing. A boozy, champagne-laden long lunch with the girls (to forget how much money they’ve just spent downstairs)? Spiedo has it all. The fit-out is simple – high ceilings, neutral tones and black and white chequered tiling at the bar. 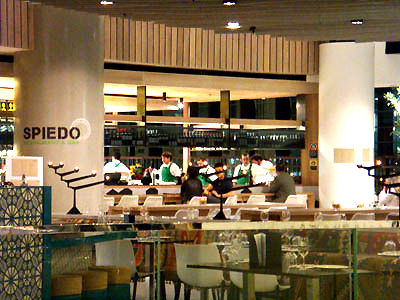 The ‘colour’ comes in the form of the almost-360 degree open kitchen and waiters kitted out in emerald green shirts. In fact, the green-theme extended all the way to the trim of the manager’s tie. While the colour immediately screamed “Shrek” to my well-trained DreamWorks-eye, once I realised that it is in fact that colour of the flag of Lombardy, I somewhat embarrassedly put my aversion aside, expressing on several occasions my love of the green touches. But the lure of a place like Spiedo is the unique menu. Renowned for his passion and love of Northern Italian cuisine, Alessandro Pavoni’s Spiedo menu is a tribute to the region of Lombardy. 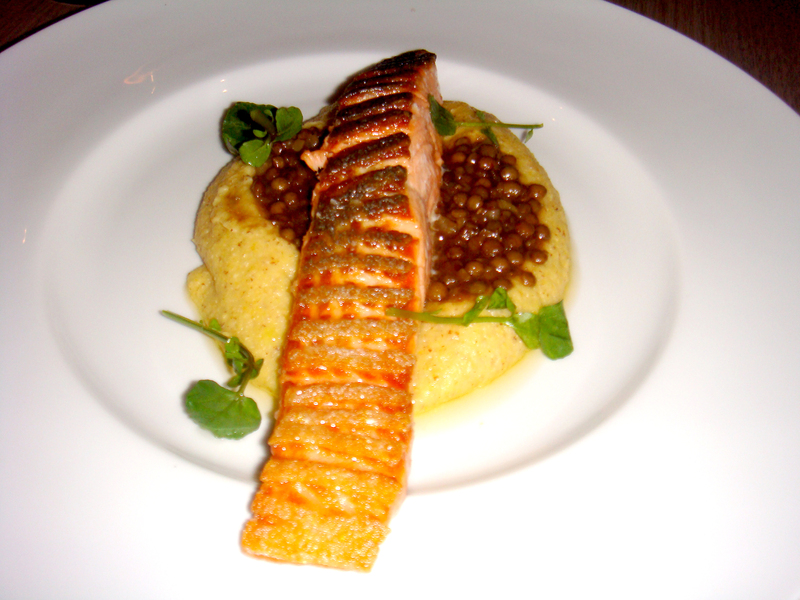 Freshwater fish, game meats and single pot dishes that include polenta and risotto set this menu apart from its competitors. Our journey began at the antipasti menu and specifically the “Sciatt”. Gooey fontina cheese was enveloped in a buckwheat batter then plunged, momentarily, into a deep fryer. The end result was a crunchy ball that oozed a viscous cream when bitten. It was the perfect beginning. Next came the organic snails that snugly sat in a beautifully butter-laden potato puree. The braising process transformed the sometimes chewy texture of the snail into a more tender consistency that, dare I say it, would convert even the most devoted of snail-haters (e.g. me= pre-Spiedo). A sprinkling of parmesan added a salty creaminess that combined the entire dish. The secondi menu came with more revelations. Not one to usually mix several types of meat in a dish, there was no way we could ignore the four-layered ‘Bresciano’ meat skewer. It took us on a textural voyage from quail to pork scotch fillet to duck and finally, pork ribs. Each meat was sweet, succulent and tender and it was undoubtedly a testament to the practised spit-roasting skills of the chef. A sample of desserts brought the meal to a most amiable end with deconstructed ‘Spiedo’ tiramisu, a dollop of house-made strawberry gelato and a chocolate torte (made with 70% cacao) topped with milk gelato. For want of a better description, the menu can only be described as down-to-earth with every mouthful making you feel loved and nourished. Spiedo draws together quite a bit of uncommon ground. We sat there in one of the most materialist and consumerist buildings in the heart of the city and yet, between the chefs chatting to one another in Italian and the wine being served in glass carafes, it oddly felt comfortable and relaxed, like home. Alessandro Pavoni of one hatted Ormeggio at the Spit has launched Spiedo as an informal restaurant and bar in the Sydney CBD. Spiedo’s Restaurant menu features many of Alessandro’s famed dishes including risotto, handmade pastas and Northern Italian specialties. The Stuzzi Bar (Stuzzichini Bar and counter) offers quality antipasti, sliced meats and salads, not to mention great coffee and beer on tap, perfect for those a bit pushed for time!